4 Star Properties, LLC has a variety of quality rental houses throughout the St. Louis and St. Charles areas. Take a look at our homes currently available for rent. Just click on the photo or address to view more photos and information. 4 Star Properties, LLC is a well-established property management company. 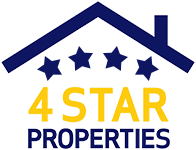 4 Star Properties, LLC provides outstanding rental homes with superior landlord service in the greater St. Louis and St. Charles Metro Area. We provide reliable property maintenance by using only highly reputable maintenance sub-contractors. We appreciate our great tenants and take good care of them!